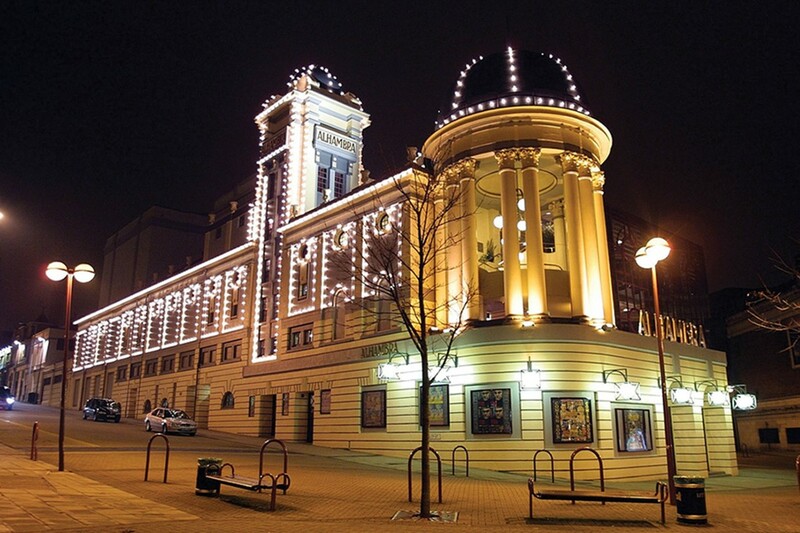 Situated in the heart of Bradford city centre, the Alhambra Theatre provides the best in large scale live entertainment, and is regarded as one of the North's premier receiving venues - from ballet and opera to variety and comedy, musicals, along with the popular annual pantomime. This beautiful theatre continues to attract the best in star names and live entertainment to Bradford with many regionally exclusive productions. Regular visits are made by the Royal Shakespeare Company, Northern Ballet, Disney Theatrical, the National Theatre, Matthew Bourne's New Adventures and David Ian Productions. The front of house areas echo the sweeping auditorium with large, airy bars and eateries overlooking Bradford’s City Park. This is exceptionally rare in an old, traditional venue – the Alhambra at over 100 years old combines a sense of history with modern comforts. The stylish purpose built Restaurant 1914 is located on the Upper Circle level, offering stunning views of Bradford’s City Park and a high quality British fusion menu for pre-show dining. The Laidler Lounge VIP bar offers a small number of guests a very special VIP upgrade experience in designer surroundings, with Taittinger champagne on arrival and private restroom facilities. The Alhambra Theatre is popular with customers throughout the Yorkshire region as well as being a source of pride in Bradford. Bradford Interchange / Bradford Foster Square. The theatre is a ten minute walk from the Interchange and from Forster Square train station. It is a five minute walk from bus stops on Centenary Square. It is across from the National Media Museum and down from Bradford College and University. For something quick and light before the show, visit the refreshed Circle Café, located on the Dress Circle level. Restaurant 1914, located on the Upper Circle level of the Alhambra Theatre, is open on performance days at the Alhambra only: matinees from 12noon and evenings from 5pm. The Alhambra Theatre offers a wide selection of drinks for enjoying before a performance or at the interval. On arrival at the theatre you can pre order your drinks for the interval and avoid having to queue. On selected evenings the bars will be open after the show.